George Osborne came under increasing pressure today to change course ahead of his autumn statement as new figures showed UK manufacturing continues to decline. George Osborne came under increasing pressure today to change course ahead of his autumn half-year budget statement on Wednesday after new figures showed UK manufacturing continues to decline. The monthly Markit/CIPS survey of purchasing managers in the manufacturing industry found any possibility of recovery remains sluggish following the nine straight months of recession. Companies reported weaker inflows of new business from clients operating in Europe and the US. 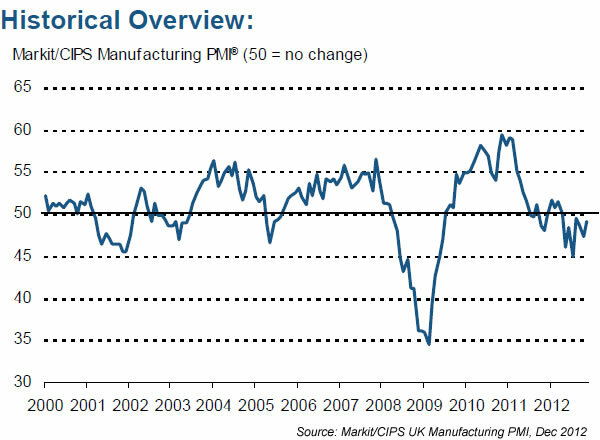 As the graph above shows, the manufacturing activity index rose from 47.3 in October to 49.1 in November, higher than many experts predicted; however, the index was below the 50 mark – the point which separates expansion from contraction in the economy – for the seventh consecutive month. There was also not much joy for manufacturing workers with companies remaining reluctant to hire. Britain has officially suffered two recessions over the past four years, despite the Bank of England slashing interest rates to a record low of 0.5 per cent and £375 billion of quantitative easing – equal to around a quarter of GDP. And according to the Institute For Fiscal Studies (IFS), most independent forecasters expect the economy to shrink this year, grow by no more than 1% next year, and by 1.5-2% between 2014 and 2016. Fisher slammed governments of the past 30 years for lacking an industrial strategy. Professor Roger Seifert, meanwhile, put the blame of the current mess on an obsession with “Thatcherite” economics.